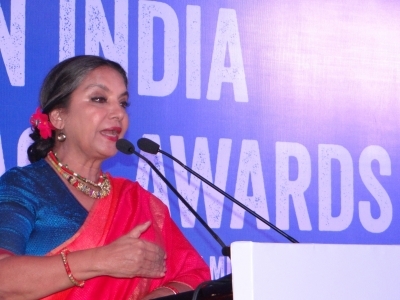 Mumbai Sep 14 (IANS) Veteran actress Shabana Azmi who will turn a year older on September 18 says that she wants to get rid of her dependence on the mobile phone. She is currently in Karjat shooting for "The Moghuls" a web series for Hotstar produced by Nikkhil Advani. "This is the first web series (for Hotstar) that I am doing. The reach of the medium is tremendous. The Moghuls is an adaptation of Alex Rutherford s historical book. It deals with Moghul history all the way from Babur to Aurangzeb " said Shabana. "I mean everyone knows Mumtaz Mahal because Shah Jahan built the Taj Mahal for her. But what was she really like? I play Babur s grandmother Esan Daulat. Not much is known about her. But she was the power behind the throne. When Babur was 12 she made sure he was crowned emperor." Shabana enjoys the freedom offered by the web. "One can tell a story as elaborately as one wants. Though Esan Daulat is little-known outside the domain of history books my character is done at length. I am shooting for 40 days for The Moghuls ." "Yes to get rid of my dependence on the mobile phone. My phone has just crashed. And I feel no anxiety about losing my numbers. On the contrary it is extremely liberating to not have to depend constantly on the phone. "So yes this birthday I d like to return to basic face-to-face conversations with people whom I care for."